Hours: Monday to Saturday 11 a.m. to 9 p.m. Closed Sunday. When a restaurateur chooses to pursue the taste memories of the dishes with which he grew up, he hopes the public will eagerly follow. And sometimes it does. But that path becomes more challenging if the cuisine is Middle Eastern, perhaps the most misunderstood cuisine in Charlotte. Last July, owners and brothers Imad and Ned Zeitouni, with nephew Wassim, opened Zeitouni Mediterranean Grill in the Ballantyne area. The Zeitouni family comes from a charming Lebanese mountain village renowned for its food — a place the Lebanese consider a culinary destination. Since the family name means olives, the logo and menu color spotlights the olive connection. For centuries, the Lebanese have arguably crafted the finest dishes in the Middle East, since their cuisine is the legacy of a dozen civilizations. 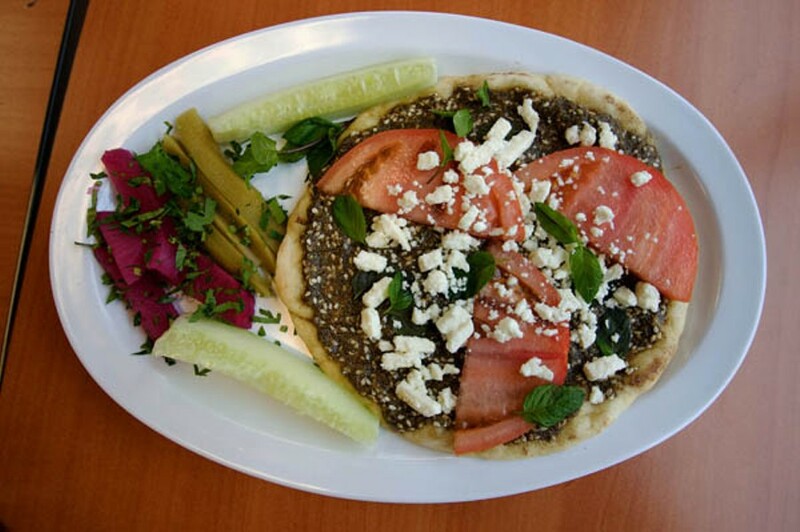 But what sets a Lebanese restaurant apart from other Middle Eastern restaurants is the consistent use of quality ingredients with a keen sense of balance and flavor. This is true at Zeitouni. Dishes that are good are very, very good. But don't get me wrong: Zeitouni is a small family-owned, counter-service sandwich shop, not a grand mezza restaurant. Zeitouni has that stark yet serviceable modern look appropriate for its genre. The corner windows overlook an expanse of asphalt in an area which, some say, devours restaurateurs. Along one sunny wall is a painting of a map of the Mediterranean; on another, a small collage of Lebanon. The menu is concise and filled with the usual suspects: shish tawook, kabob, shawarma, and falafel sandwiches, which also come as entrées. Surprisingly, I watched many customers ordering gyros — hence the Mediterranean description. But not to try the food that's at the heart of this restaurant would be regrettable, since the Lebanese dishes are infinitely more exciting than the gyro. 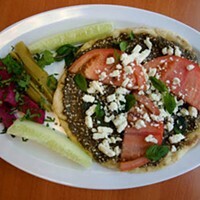 Take the Zaatar starter. Za'atar is actually a common blend of seasonings — thyme, oregano, marjoram and sumac. But this dish is a twist on a popular Lebanese breakfast: manoushi bi-za'atar (usually delivered hot to your door in Lebanon). Manoushi is made from a flat farmers' pita. Zeitouni crafts this app on a thicker Greek pita and then layers the seasoning mixture, feta, slices of tomatoes, and fresh mint leaves. Marvelous. Another happy surprise was the moist and flavorful kibbeh special one night, sided with tabbouleh. As I ordered, Wassim's mother looked intently at me and said, "I will make you some fresh from the back." Nothing is better than freshly made tabbouleh; this is the only way it should ever be served. Tabbouleh should never sit in a glass case. Sandwiches (all under five bucks) are another strong suit: garlicky chicken and appropriately spiced shawarma flecked with parsley mint. In the room-for–improvement department are the grape leaves, a bit chewy. I've had better, but I've had much worse, too. The vegetarian mezza platter, though, rings every bell with wonderfully smoky baba ghanoush, fried potatoes spiked with cilantro and garlic, and crispy Lebanese-styled pan-fried falafels. For dessert, several kinds of Lebanese baklava are shipped in from a Lebanese bakery in Dearborn, Michigan, and packages of ma'amoul, Lebanese shortbread pastries, are available. Go with the Turkish coffee and baklava, though. The latter may not be made in-house, but I have not had better outside Beirut. Oddly, I was not served any olives here. Nonetheless, the Lebanese dishes at Zeitouni have raised the Mediterranean bar around town.